Tis’ the Season to be Clean! 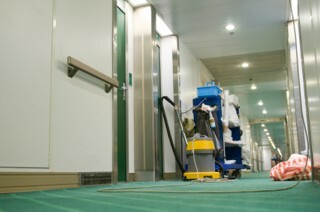 Commence the time when cleaning is a top priority in work facilities! Ring in the cold Massachusetts winter months with a bright clean office. The end of the fall season is a great time to get rid of unwanted items in the office. Also, to inquire about special cleaning tasks to be performed in your work facility: Have your carpeted surfaces cleaned, VCT floors stripped and waxed, office items thoroughly disinfected, windows washed, decluttering paperwork, and other important cleaning services. A professional janitorial service will not only handle these cleaning actions, but they are capable of creating a list of cleaning specifications customized to your office’s needs. Let’s start with floor care. Take a look around your office and check out the condition of your floor surfaces. Are your carpets stained? Have your VCT floors lost its’ sheen? Do your granite stone floors appear dirty? How about the entrance mats and stairs? Foot traffic, spills, and stains damage these areas on a daily basis. Without professional floor care, the quality of these surfaces can be compromised and may lead to having to rip out and replace the floors. Avoid having to spend more money on the negative outcome of neglect. Carpet cleaning should be a frequent occurrence depending on the condition of your floors and how often they are being walked on. A busier office that accommodates more workers and visitors may require carpet cleaning every few weeks. On average, consider having a commercial cleaning company clean and deodorize your carpets at least once year. This applies to VCT floor care, hard floor surface cleaning, and other types of floors. A high speed buff and machine scrubbing will enhance the image of your floors. Onto disinfection… Flu season is creeping upon us. Germs, colds, coughs, and other illness lingers and spreads rapidly among office workers. Ill workers equals sick days and unwanted time off from work. Avoid the stress of having your employees get sick by taking proper disinfection protocol. A professional cleaning crew will disinfect all surfaces; especially heavily handled office items like door handles, phones, light switches and more. Taking precaution and appropriate action during the cold season will ensure a healthier work environment. Professional window cleaning should be another task performed on a reoccurring schedule throughout the year. Before winter arrives, plan on contacting your janitorial company for an interior and exterior cleaning of your office windows. Clean windows will help your business stand out and look great from an inside and outside point of view. Weather can effect the condition of your windows; Rain and water can create stains and deposits on the surfaces. Pollen and dirt will make your work windows appear dirty. Hire the professionals to take care of the cleaning of your work facility’s windows. Lastly, decluttering is something that workers tend to put off due to lack of time and energy during the work day. However, this is a very important cleaning task because clutter creates dust, decreases space, and subconsciously clogs up your mind. A clean desk can allow more productivity to occur in an office. Clean and clutter-free spaces will help you and your office employees focus on their work, versus the mess on their desks. Try removing old paperwork and trash from your office to see if productivity increases. Dust and dirt are less likely to accumulate as much as it would with a massive amount of items spread throughout your work area.